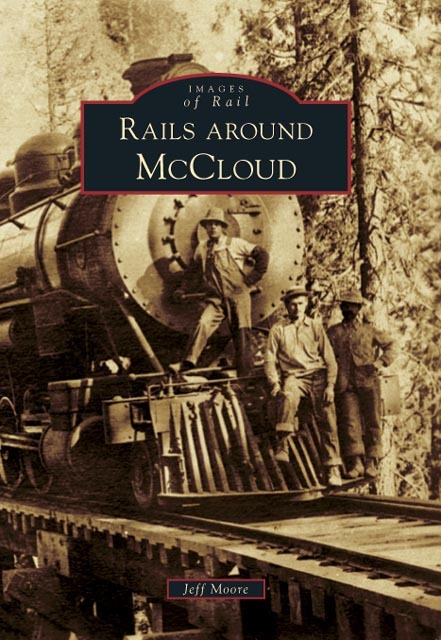 Rails Around McCloud arrived on schedule on 14 January 2008. The book has been well recieved and got several good reviews in the local media. Numerous retail establishments in the McCloud- Mt. Shasta- Dunsmuir area have picked the title up, and it continues to be available through all of the major book stores and most independents too. I appreciate the feedback that I have been given so far, and I am always interested in hearing what people like and don't like about the finished product. Page 2- During the production process, the left side of the map got cropped off. All of the information I intended the map to convey is there, but some of the letters in the legend are missing. Pages 24 and 25- a couple of photo credits got swapped here. The photo on the bottom of Page 24 should be credited to the Jeff Moore collection, while the photo on the top of Page 25 should be credited to the Heritage Junction Museum. Page 35- I inadvertently changed a "Pondosa" to "Ponderosa" halfway through the caption and did not catch it. Page 47, top photo- The move to Camp Kinyon did not occur until at least after the 1951 cutting season, not 1948 as stated in the book. This information came to light after the book went to press. Page 101- I regret the wording of the final sentence. It should have read something like "The passenger business keeps the line west of McCloud operating." These are the specific changes that I have found so far. Thank you to all who have purchased the book, and please feel free to send along any and all comments that you may have.